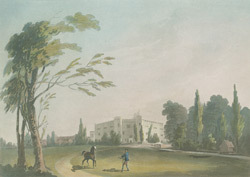 View of Hertford castle in Hertfordshire by R. M. Batty. This building is in fact the gatehouse of the original castle which no longer exists. There was a motte and bailey castle here in the Norman period and this had been built on the site of an earlier fortification built by Edward in Elder in the year 909. The large stone castle that stood here was destroyed in the 17th century. The gatehouse was built in 1461-5 and originally had three stories and a basement. In the late 18th century the gatehouse was altered and extended by the Earl of Hillsborough.